Nestled on the waterfront of Palm Jumeirah, The Retreat Palm Dubai MGallery by Sofitel boasts the ideal ambience for visitors looking to relax and unwind in the lap of luxury. If you're seeking a quick getaway from the city's constant buzz, a stay at this haven of tranquillity certainly fits the bill. The perfect escape for the mind, body and spirit, The Retreat Palm Dubai MGallery by Sofitel offers a variety of solutions to help guests achieve their health and wellness goals. Experience bliss by the seaside with a stay at the resort - just the experience you need to enjoy some quiet time against the backdrop of the vibrant city. myconcierge members can book a one-night stay for a special rate inclusive of access to the private beach, pool and gym. A healing sanctuary in the bustling heart of Dubai, The Retreat Palm Dubai MGallery by Sofitel designs experiences meant to rejuvenate, boasting varying levels of relaxation. From daycations at the facility to stays that encompass restorative rituals at the spa, there's plenty for everyone. The resort also boasts the world's first Rayya Wellness centre offering a range of holistic health and wellbeing programmes with customised solutions to suit every requirement. The wellness centre houses a state-of-the-art spa, a gymnasium, a wellness clinic as well as a host of recreational facilities that help harmonise the mind and body. Additionally, a team of healthcare experts and lifestyle consultants are always on hand to ensure you're on the right path towards personal transformation. 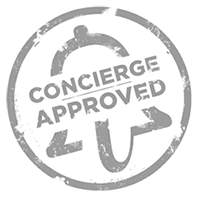 myconcierge members can also choose from two additional packages to enjoy the very best of the property. Those looking for a midweek recharge or a stress-busting weekend can book a day pass to The Retreat Palm Dubai MGallery for the special price of AED225 per person with food and beverage credit worth AED100. And if you're looking to extend your downtime with a visit to the spa, you can opt for the hour-long Slimming Massage that includes a full body cryotherapy session followed by oxygen therapy to leave you feeling refreshed. Standard check-in time is 3pm and checkout time is 12pm the next day. Tourism fee of AED15 will be collected upon checking in.